Fly low over California, and you’ll see a patchwork of black and shiny rooftops fitted – with solar panels. It didn’t always look like this. Just over a decade ago, there were fewer than 500 solar rooftops in the state. By last year, that jumped to over 160,000. Much of that growth has happened in just the past few years. 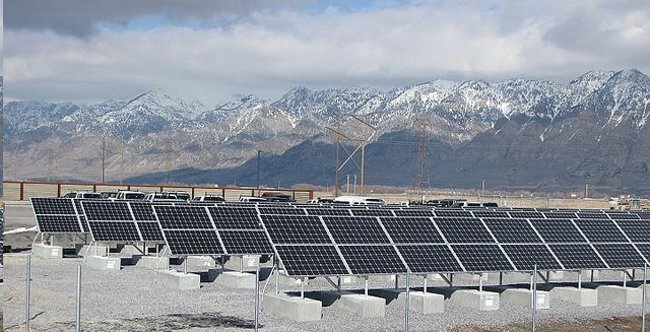 It doesn’t stop there; national industry analysts say the solar sector grew by a third in just the first quarter of this year, with California leading the charge. A few things are making solar more accessible, among them: cheaper panels, rebates, and new ways to for pay for them. Crowdfunding is among these new and creative ways to finance solar panels. Instead of paying tens of thousands of dollars to install solar, other people pitch in and get something in return. It’s like a Kickstarter for your electricity bill – and it’s a business model that allows people to participate directly in making solar happen. “All our neighbors are totally residential homes and when they got solar, we thought wow, our roof is the same exact slope as well,” says Johnson. As they were figuring out their options and getting quotes, they got an unexpected offer. A man named Andreas Karelas offered them a lease to own a system that would power 100 percent of the center’s electricity needs. They wouldn’t owe any money up-front and their monthly bill would drop. In other words, to crowdfund the dance center’s solar panels. RE-volv raised about $25,000 through foundations and donations from 300 people around the world. That money paid for the upfront costs. Once the project was underway, the dance center started paying just under $300 a month to lease the panels. That money goes into a fund that generates interest and helps pay for future projects. So when you donate 50 bucks to the dance center’s roof, you’re not just supporting them – you’re also helping other projects down the line. “So our hope is that people will be eager to kind of put their money into something where it does earn a return but they're not asking for the return back themselves. They’re asking for the return to be reinvested into more and more solar, allowing it to grow exponentially,” says Karelas. This is pretty different from how solar providers usually work. In a typical lease, the dance center would make payments for 10 or 20 years, then at the end of that, either renew the lease or buy the system at market value. If they didn’t, or couldn’t, the company might take the panels back. With RE-volv’s model, the dance center will own its system outright after 20 years. “For us it’s not so much the finances as the decision that we made and having our community know that their dancing is now solar-powered is just a powerful sense of community,” says Johnson. RE-volv is just one of several companies trying out models for crowdfunding solar energy. Dan Rosen is the CEO of Mosaic, an investment crowdfunding company based in Oakland. Their model also offers a return – but this one is for investors. “Where our base of investors can become advocates and some of the best advocates for clean energy, because they're invested in it. Because they have skin in the game,” says Rosen. Mosaic provides an online platform where anyone can invest directly in a clean energy project and earn 4-6 percent interest. Investments can be as little as $25. So far, Rosen says Mosaic has financed 15 projects, raising $3 million from about 2,000 people. For example, 138 people paid to put solar panels on the roof of the Asian Resource Center or ARC, a building that houses a bunch of nonprofits and businesses in Oakland. ARC now makes monthly lease payments of about $340 to Mosaic. ARC’s payments help pay each of those investors a return. “So Mosaic is bringing a new source of capital to the table that is people power. That is powered by individuals and small institutions. And institutions that want to invest in clean energy,” says Rosen. “I think that has the appeal for some investors who couldn’t otherwise get into investing in solar PV very easily of being able to make small investments and still get into this market,” says Severin Borenstein, co-director of the Energy Institute at the Haas School of Business. He says it’s a niche market. “As far as the growth of this industry I think it’s going to be driven by the economics, both the true costs of installing solar relative to retail electricity prices and the tax treatment,” says Borenstein. Though he says the retail cost of electricity is higher than the actual cost, which raises questions about the stability of the solar sector. “The way it is in California, people pay a higher price per kilowatt if they consume more,” says Borenstein. That’s because most utilities roll the fixed costs of the transmission lines and managing the grid into our electricity usage. So going solar also means the utility eats that additional cost. “Those very high prices you’re paying don’t reflect the actual cost of supplying power to you,” says Borenstein. This makes going solar more attractive and utilities see the threat. “The utility recognizes it’s giving incentives for people to install solar instead of buy their power from the utility and as a result they are trying to change those tariffs,” says Borenstein. For example, to change the rates to charge everyone a fixed monthly fee for being connected to the grid. If that happens, Borenstein says the whole solar sector could slow. But for now, it’s still growing. “Crowdsourcing and crowdfunding is a way that we can democratize energy,” says Rosen. He sees crowdfunding as a way to change the whole energy industry. He anticipates major growth in solar rooftops, enough to disrupt the way utilities currently work. Where people with their own energy sources – like solar panels – distribute the excess to their neighbors. “A world of where every home could essentially be a power plant. Because it really is inevitable. It's cheaper to put solar on your home than not. It will happen. It’s economics,” says Rosen. Solar still makes up less than 1 percent of the country’s total electricity production today – rooftop solar makes up even less of that. Crowdfunding projects have a long road ahead. But they’re hoping it’s a sunny one. This work was supported by a 2013 New America Media Energy Reporting Fellowship in collaboration with SoundVision Productions’ Burn: An Energy Journal. Photos: Mojo Mike (Flckr); USFWS Mountain Prairie (Flickr).